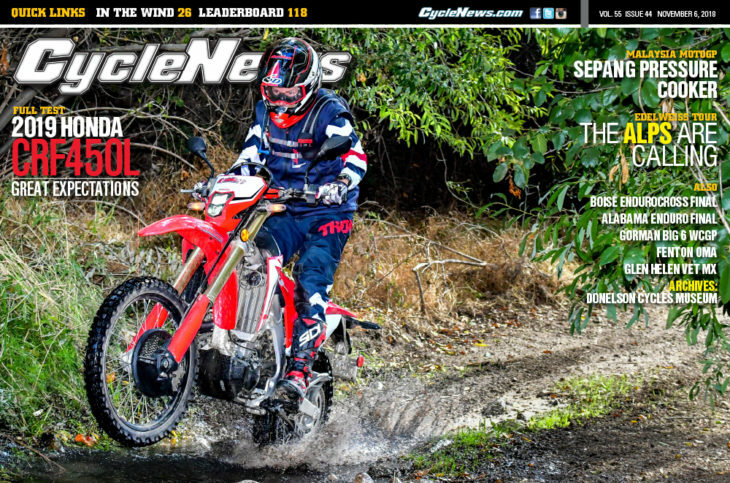 The new Honda CRF450L dual sport is caught splashing its way onto the cover of Cycle News magazine this week. We have a full test on the much-talked about dual sport bike. In a future issue, we compare it to the KTM, Husqvarna and Beta, so stayed tuned. We also have full coverage of the Maylasia MotoGP from Sepang, where Marc Marquez performed his magic again. Two major national champions were crowned in off-road racing, and we tell you all about that. We also show you some of the hottest bikes from the EICMA motorcycle show in Milan. Plus, we tell you what it’s like to participate in one of the famous Edelweis Motorcycle Tours. And, as always, we get you caught up with all of the latest motorcycle news from around the world. It’s all right here in one convenient place. Check it out. It’s free and just a click away. Cycle News Magazine #45, November 6, 2018. Click here for the latest issue of Cycle News magazine.